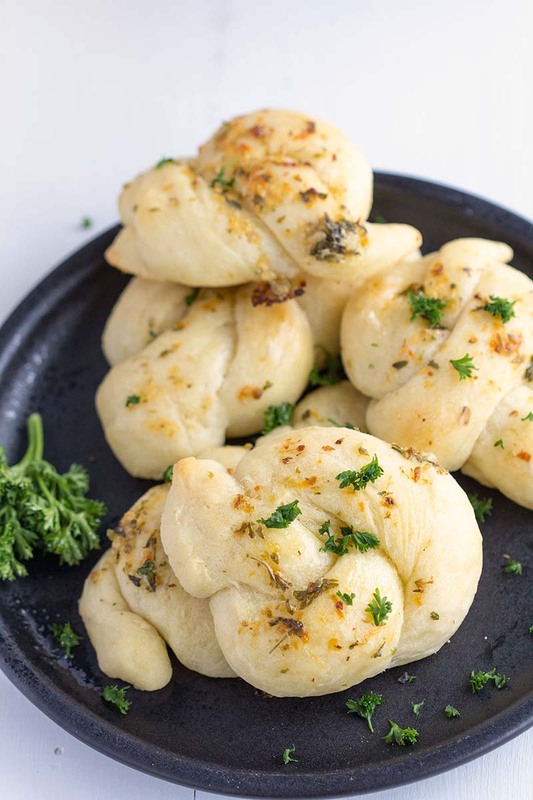 From scratch, soft hand rolled garlic knots topped with Parmesan cheese, garlic and herbs for a delicious side or starter. Perfect with pasta and pizza. Cover with plastic wrap and let dough rise for 60-90 minutes or until doubled in size. Lightly grease 2 large baking sheets or line with non-stick baking mats. Set aside. Place dough on a lightly floured surface. Divide in half. Press each dough into a rectangle. Slice the dough into strips of about 1 inch wide by 5 inches long. Cut these strips in half. Roll each piece on the counter and then tie each strip loosely into a knot, stretching gently if necessary. Dust counter with flour as necessary to prevent sticking. Place on prepared baking sheets about 2-inches apart. Brush with olive oil. Cover with plastic wrap or a clean towel and let rise in a warm spot for about 30-60 minutes. Meanwhile, towards the end of rising time, preheat oven to 375°F. In a small bowl, combine the melted butter, Parmesan cheese, parsley, oregano and minced garlic. Brush knots with half the mixture. Bake until golden brown, about 20 minutes. Remove from oven and brush with remaining butter and herb mixture. Serve warm.